I thought that this would be a good introductory post. Something simple and strange inspired by an ingredient I was using to make dinner and another ingredient that was hanging out in the fridge. Found ingredients are where most of the dishes in this blog will come from. The munchee quest for most of us ends with a combination of what we have close by along with the desire to blow our minds and satiate our bellies with something so comforting or so strange. 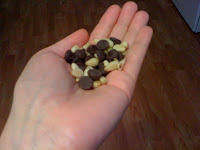 If you happen to be the type of stoner cook who keeps pine nuts and any type of chocolate around, this is a quick, easy, rich and satisfying snack. If not, then any warm nuts and chocolate are delicious.